Visiting Tokyo, perhaps the most hyper-modern of all cities, feels almost surreal with its into-the-future-like architecture, trend-setting youth fashion, pop culture geekery, and neon-lit skyline. 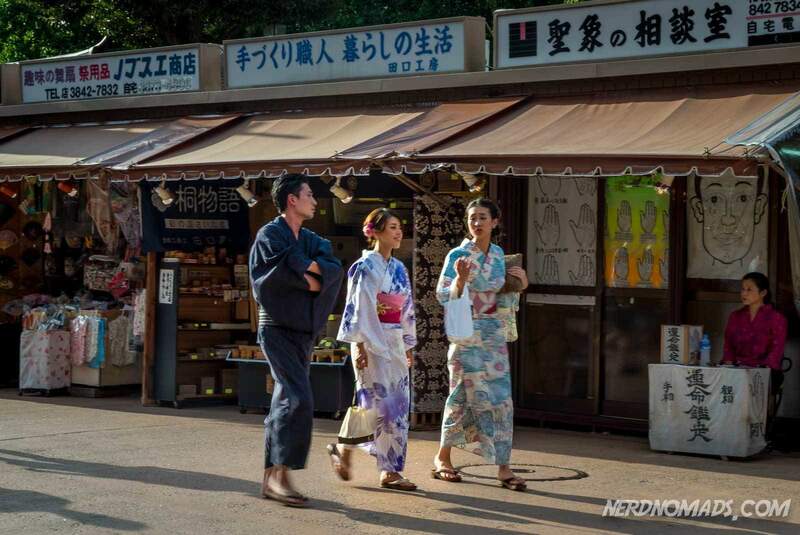 However, it is also a city alive with ancient history and strong traditions, where traditional Japanese Inns still welcome guests into old Edo period houses, and beautiful temples fill with worshippers as they have for hundreds of years. 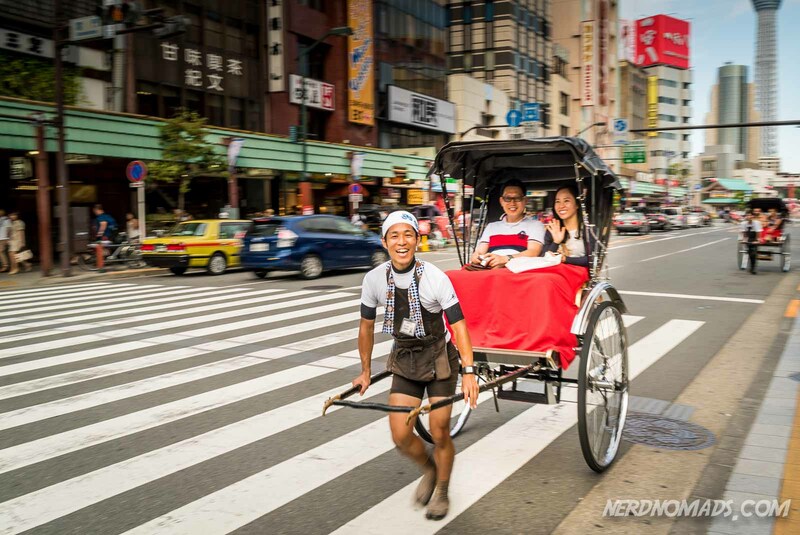 This exciting blend of old and new is what makes Tokyo such an exciting city to visit. 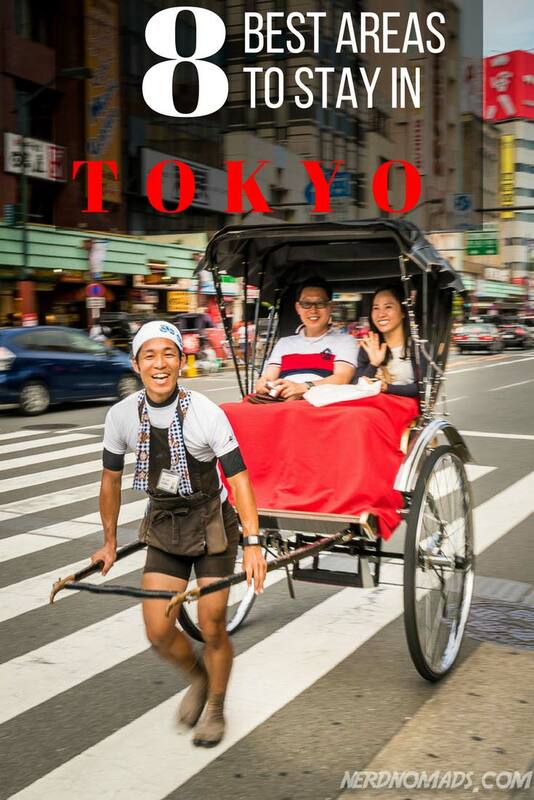 As one of the most visited cities in Asia with there is no lack of hotels, hostels, and ryokans (traditional Japanese guesthouses) at every price range available, but with more than 40 different neighborhoods, figuring out where to stay in Tokyo can be a challenge. Tokyo is more a collection of suburbs each with their own center than one large cohesive city, and every area has its distinct personality. The west side of Tokyo is the modern side with its futuristic architecture, enormous shopping malls, cinemas, and nightlife while to the east lies what used to be the old Samurai districts with their magnificent temples and historic sites. The hotel standard in Tokyo is overall excellent with comfortable rooms that have everything you need. However, hotel room prices are comparable to many European big cities, and since space is a valuable commodity in Tokyo, the rooms tend to be small. The Japanese are always polite and offer excellent service, but the language barriers can sometimes become a bit of an issue since many Japanese don’t speak much English. To get around Tokyo easily, we recommend staying close to a metro station. Tokyo has one of the world’s most efficient metro subway systems crisscrossing the city. The JR Yamanote Line, often called “the loop line”, connects the most famous Tokyo areas and staying close to it is probably the easiest option but anywhere with a metro station will allow you to quickly access any part of Tokyo. 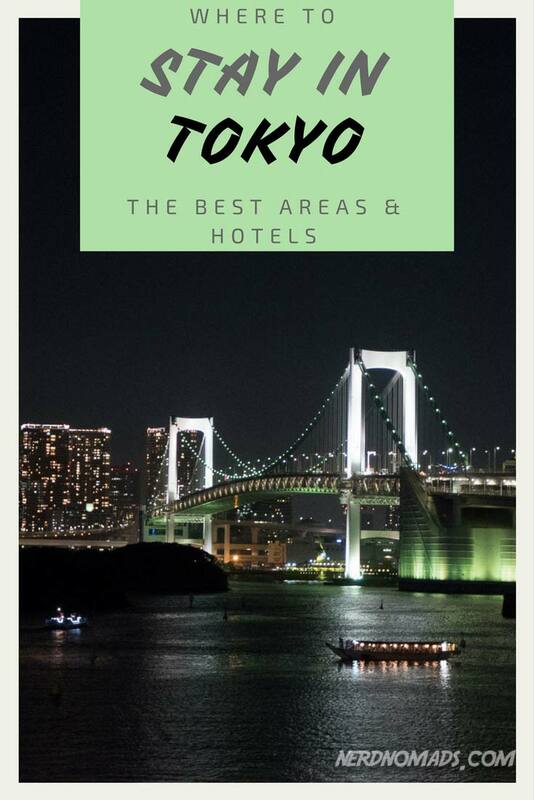 We have spent months researching this guide both before, during, and after the weeks we spent in Tokyo searching for the “perfect” accommodations for every budget. To make this as complete and as useful a resource as possible, we have also included some recommendations from people we know and whose opinion we trust. None of the hotels recommended here are paid placements or have sponsored our stay in any way. We pay for our accommodations ourselves when we travel. If you book through any of our links, we make a small commission, at no extra cost to you. This helps keep our site running – so thank you in advance for your support! 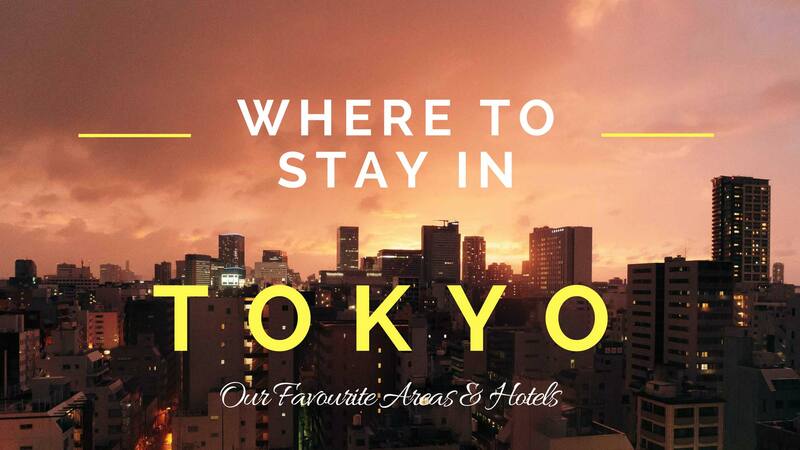 We hope you find this guide helpful in finding the best place to stay in Tokyo. Shinjuku is by many considered the best area to stay in Tokyo for tourists. There are lots of options for accommodation, entertainment, and shopping here. Shinjuku is the Tokyo you see on TV with its neon lights and the futuristic skyscrapers. During the day Shinjuku is a great area for shopping with big modern shopping malls like Lumine, Takashimaya Times Square and Odakyu filled with both international and Japanese brands. But it’s in the evenings that Shinjuku really comes alive and the dazzling display of neon signs reveal the hundreds of bars, restaurants and entertainment options available. The heart of this area is the Shinjuku train station, one of the busiest stations in the world with over three million passing through each day. From here you can easily get to anywhere in Tokyo and also out of Tokyo to other parts of Japan like a day trip to Hakone and Mount Fuji area with the Odakyu train or public bus, as well as the Narita Express train to/from the airport. The west side of the Shinjuku train station (Nishi-Shinjuku) consists of corporate buildings and towers, like the Tokyo Metropolitan Government Building and the iconic futuristic Mode Gakuen Cocoon Towers. Some of these buildings are really cool, so make sure to look upwards as you walk around Shinjuku. Well worth a visit is also the Golden Gai neighborhood with its many charming old tiny bars and restaurants. Many of which can only accommodate a handful of visitors at a time. Some are exclusive to local patrons and may politely let you know that when you poke your head in. Look out for menus in English outside the door for a good indication that they accept foreign customers. Outside the west gate of the Shinjuku train station lies Omoide Yokocho or Memory Lane. Similarly to Golden Gai Memory Lane is a narrow lane filled with restaurants and bars. It burned down in 1999 but thankfully the government decided to rebuild it exactly as before, preserving this little piece of old Japan. Here the smell of barbequed meat hangs heavy in the air and the specialty is Yakitori, grilled spears of chicken, but you will also find other more exotic dishes such as grilled salamander and pig testicles. The alley is often nicknamed Piss Alley, and you won´t find fancy cocktails and pink drinks here but plenty of good beer and sake. Be warned that vegetarian options are as good as nonexisting. 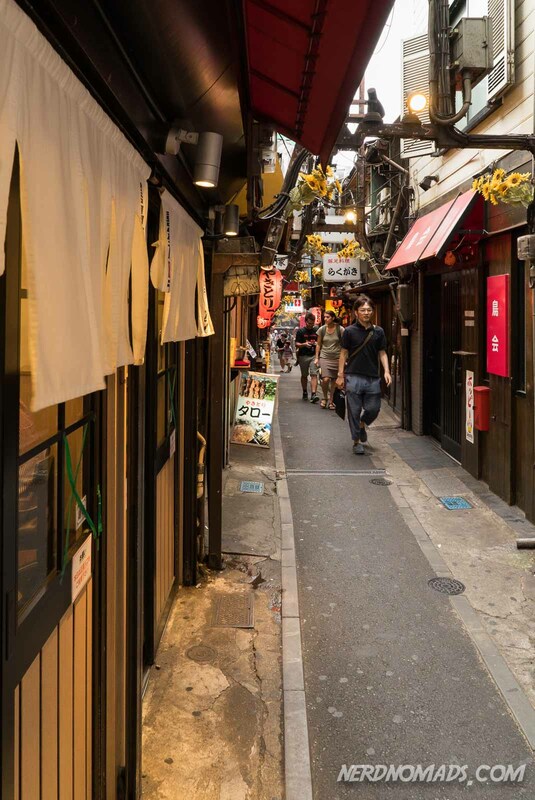 Golden Gai and Memory Lane have been unchanged since the second world war and it is a miracle they have avoided being swallowed up by the modern Shinjuku. The Shinjuku area is also home to a labyrinth of narrow lanes with small stalls selling every conceivable item. It is great fun to walk around here and get a little lost. Don´t forget to sample some of the street food along the way. To the east side of Shinjuku train station is Kabukicho, Tokyo`s biggest, bustling, and most vibrant modern entertainment area with its many bars, restaurants, and cinemas. Enjoy the Tokyo skyline view: Tokyo Metropolitan Government Building (observation deck at the 45th floor, 202 m high). On a clear day, you can see Mt. Fuji. The best of all, it is free! Go bar hopping inside the maze-like small streets of the Golden Gai district and get a glimpse into post-war Tokyo. If you want a surreal experience, check out the Robot Restaurant where you get a fantastic robot show while having something to drink or eat. The Tokyo craziness in a nutshell! 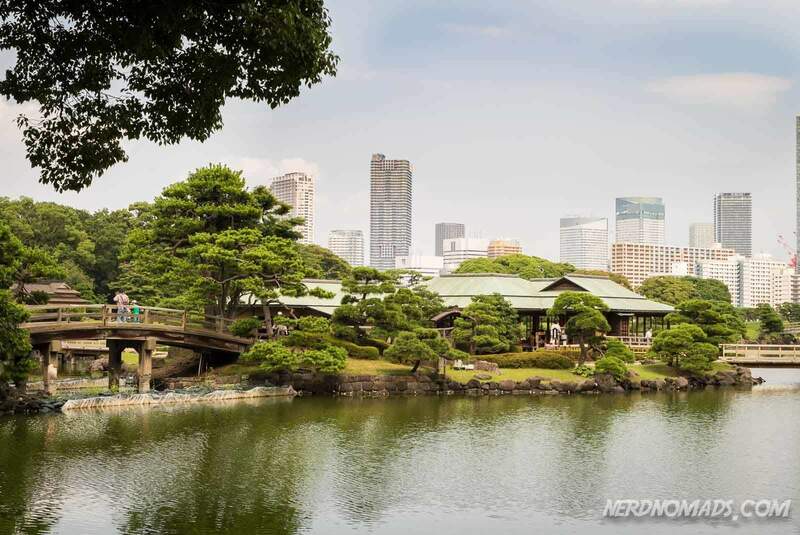 Shinjuku Gyoen – visit perhaps Tokyo’s most beautiful garden. Inokashira-koen park has a pond where you can rent rowboats and swan pedal boats. There is also an ancient shrine here, dedicated to the sea goddess Benzaiten. This park is one of the best places for night blossoms in cherry blossom season. Go camera shopping – Shinjuku is camera heaven for both photography enthusiasts and collectors. Here you will find lots of camera stores for both new and vintage equipment (take the west exit at Shinjuku station). We bought our camera lens here at half the price of at home. Shinjuku can be pretty crowded with people, especially at weekends, and in the evenings you can be sure to meet some white-collar workers that have had a drink or two too many raving around in the streets. Kabukicho also has a seedier side to it with Tokyo’s biggest red light district housing some dodgy bars. Shinjuku’s popularity has made it an expensive area when it comes to accommodations. Probably Tokyo’s most famous hotel and even more so since it featured in the movie ‘Lost in Translation’. The Park Hyatt is one of the most exclusive and luxurious hotels in Tokyo. The hotels 178 rooms are among Tokyo’s most spacious and elegant and provides all modern comforts. The hotel service is legendary, and the hotel has several world-class restaurants. Located on the top floor with stunning views over the city is the world-famous New York Bar Grill, where Bill Murray’s character enjoyed his evenings. There are an indoor pool, a fitness center, and spa. It’s an excellent choice for a honeymoon or a special occasion. This modern hotel is located right above(!) the Shinjuku train station and offers an excellent view of Tokyo. It is easy to get here from the Airport using the Narita Express train, and it is a perfect place from which to explore Shinjuku and the rest of Tokyo. The rooms are large by Tokyo standards and have all modern amenities such as flat screen tv, air-con, mini-bar, and free Wi-Fi. The hotel has a fitness center, and there are lots of restaurants and shopping malls within easy walking distance. The staff are very helpful and speak English quite well. This is a new hotel that is getting some rave reviews lately. The hotel’s location is in the Shinjuku Toho building, the tallest building in the Shinjuku area, with spectacular views of the city. The rooms are relatively spacious, clean and comfortable with flat screen tv, air con, and refrigerator. There is plenty of restaurants around the hotel and Shinjuku station is about a block away. This has been one of the most popular mid-range hotels in Shinjuku for years and is often sold out weeks in advance. So what makes it so popular? Its location is fantastic on a quiet side street just minutes away from the Shinjuku’s many restaurants, malls, and nightlife. The hotel itself is fairly average, and the rooms are tiny, but its location is great. This hotel has an excellent location within just a few minutes walk from Shinjuku-sanchome station in Tokyo’s shopping and entertainment center. The hotel is bright and modern, with smallish but comfortable rooms that include a tv, refrigerator, microwave, safe and a washing machine(!). Wifi is free and fast. They serve breakfast in the bar next door. In an otherwise very expensive part of Tokyo, this hotel offers excellent value for money. 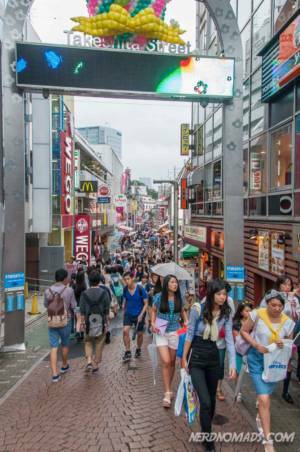 To sum up Shibuya; you will find action and lots to do 24/7! You will not have a single dull moment in Shibuya. Shibuya attracts a younger crowd. This is where the teens of Tokyo gather and hang out with their bright futuristic clothes and colorful hair. They all meet up at Hachiko Plaza, named after the famous Hachiko dog which Japan loves, right in front of the Shibuya train station. Shibuya Crossing, opposite the Shibuya train station, is the center of this area. This crossing is the world`s busiest street crossing, leading to the walking street Centre-gai, Shibuya`s main artery. Here you will find lots of shops, bars, cafes, and restaurants. Shibuya station has both the regular subway as well as the JR train routes making the area well connected and a convenient base for exploring Tokyo and beyond. Harajuku is a small area within Shibuya that is most famous for being the center of Tokyo’s goth/ zombie/ emo-like subculture. Youths from all over Japan come to shop for clothes and accessories in the dozens of small specialty stores that line the small narrow Takeshita-dori street. If you are a young traveler yourself or if you are traveling with teenagers then this is an area you should definitely explore. The wide boulevard-like street Omote-sando, sometimes called Tokyo’s Champs Elysées, is the main artery of the Shibuya-Harajuku area, packed with chic modern designer boutiques and international fashion brands. And what`s extra cool, is that the buildings themselves are designed by famous architects to match the store the building houses. So make sure to take a look at the facades of the buildings themselves and not only what’s inside. 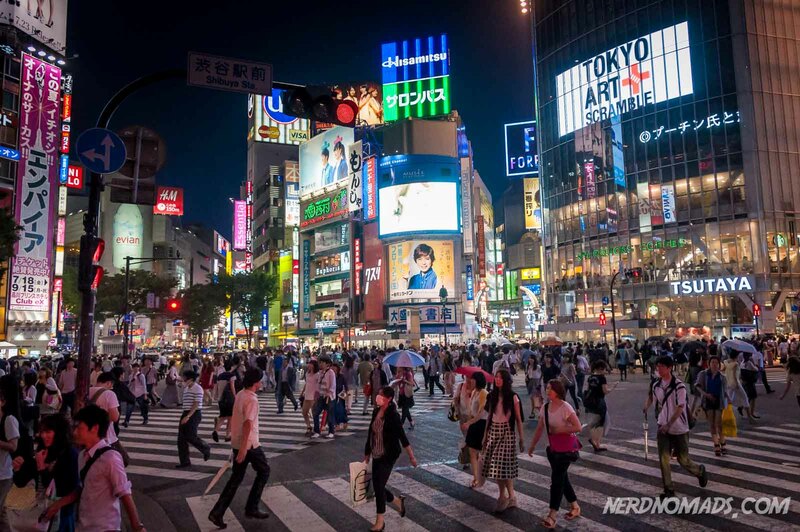 Shibuya Crossing – No. 1 attraction and thing to do in Shibuya is to walk through the world’s busiest pedestrian crossing a couple of times, or just stand on the pavement watching the crowds. The crossing is famously known as “The Scramble”. If you want a bird`s eye view of the whole walking show, visit the Starbucks Cafe (second floor of the ukutaya bookshop) right opposite the Shibuya crossing and have a cup of tea, coffee or hot chocolate while you view this human phenomenon. Cat street – One of our absolute favorite streets in Tokyo is Kyu-Shibuya-gawa Yuhodoro, popularly called Cat street. It connects Shibuya and Shinjuku and has a completely different and more relaxed atmosphere than the hyper-busy Harajuku and Takeshita-dori street. Lined with cool fashion shops and second-hand clothes boutiques, restaurants and independent cafes. Try a burger at The Great Burger, our favorite Tokyo burger joint! 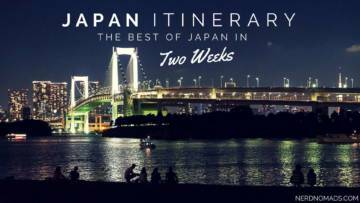 See our Tokyo itinerary day 1 for more details. Hachiko Statue – Right outside of Shibuya train station you will find the bronze statue of the famous and beloved Akita dog Hachiko. The story of him is famous all over the world, and he has become a legend. There is even a Hollywood movie of Hachiko, the dog. 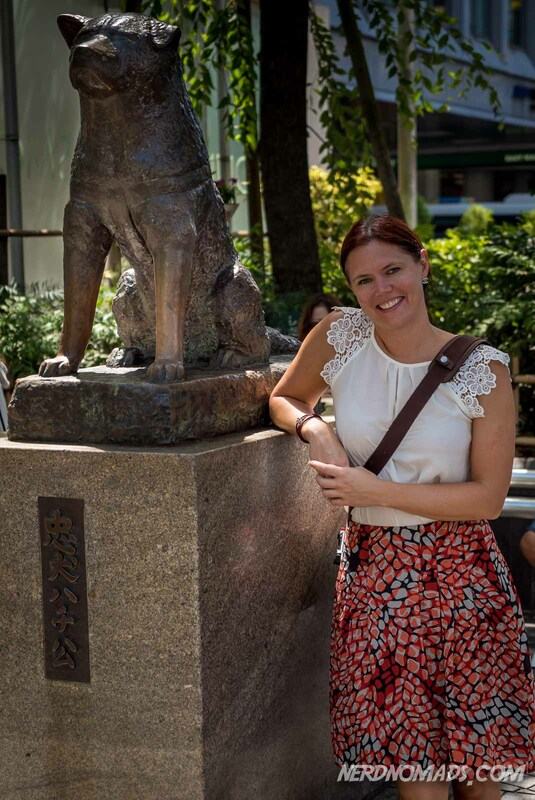 Read the full story of Hachiko here. Meiji-jingu Shrine – This is Tokyo`s grandest shrine, dated back to 1920, dedicated to Emperor Meiji and Empress Shoken. It is a must-see when in Tokyo. Extra plus: FREE entrance! Second-hand clothes shopping – hit Harajuku Street and Cat Street for some hip second-hand clothing stores. Yoyogi-koen Park – This is an enormous and charming park and the perfect place to go for a walk or run, play frisbee, have a picnic or just lay down to get some sun if the weather is nice. At weekends you will find lots of entertainers in the park, playing instruments or dancing. Tokyo Photographic Art Museum – This is Tokyo’s best photography museum, housing photo exhibitions of both international and Japanese photographers. Beer Museum Yebisu – Located on the site of the original Yebisu Brewery, this museum has photographs and antiques from the Japanese beer industry. You can also taste different kinds of beer at the “tasting salon”. There are lots of people in this area, especially during the weekends. There is also a small red light district here. This hotel overlooks the famous Shibuya crossing, right in the center of Tokyo’s most famous entertainment district. It’s a very elegant hotel with relatively spacious (for Tokyo) and well-decorated rooms. There is a lovely indoor pool and fitness center although they stupidly charge extra for its use. The bar on the 40th floor offers some spectacular views. A small boutique hotel well located in the ever happening Shibuya with lots of cafes, shops and restaurants just a few minutes walk away. The standard rooms are small but modern and have all comforts such as flat screen tv, air-con, refrigerator, and free Wi-Fi. If you require more space consider upgrading to their premier rooms. Breakfast is good with plenty of variety and is served in two locations (make sure to go to the one on the 2nd floor). Shibuya is not a great area for budget hotels. Tokyu Stay Shibuya is a decent alternative and has spacious rooms, a kitchenette, and a washer/dryer. It is located on a quiet street close to Shinsen Station. Be aware that if you are coming from Shibuya station, it’s an uphill 15-minute walk. The staff is very helpful, although not everyone speaks English very well. Why Stay In Ginza, Tokyo Station & Tsukiji? This area has some of Tokyo’s best top-end luxury hotels. With its broad boulevard-like streets, Ginza is Tokyo`s answer to New York`s Fifth Avenue, or London`s Oxford Street. 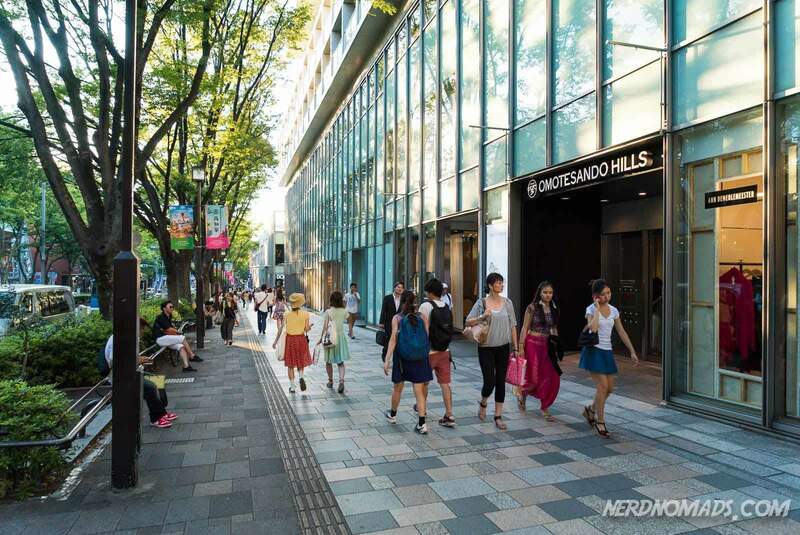 It was the first area of Tokyo to be modernized in the 1870s and has modern Western-style buildings and some of Tokyo’s most upscale shopping malls. Nowadays, Shinjuku and Shibuya have outshined Ginza a little when it comes to shopping, vitality, and energy, but Ginza still has the posh factor with all the famous high-end brands. It is also the perfect place to go window shopping and people watching. In the evenings the shops really light up and put up quite a colorful display to attract shoppers. On the weekends the traffic is closed off and Chuo Dori, the main shopping street, becomes a pedestrian-only zone which is really cool. In the evenings the nightlife around Giza is quieter and more upscale and mature than for instance Shinjuku with plenty of good restaurants and cocktail bars. It is also a very safe area and excellent for families traveling with children. Several subway stops make Ginza a great base from which to explore the city. Just a short walk southeast of these luxury shopping streets, you will find the world famous fish market – Tsukiji Fish Market. The active fish market has moved but the outer market is as lively as ever and there are tons of excellent seafood restaurants here. Ginza is also the home of the Imperial Palace and the gardens surrounding it. To the east is the bustling business district of Marunouchi with several glossy towers like the Marunouchi Building with its restaurants, shopping and great views of the imperial grounds. 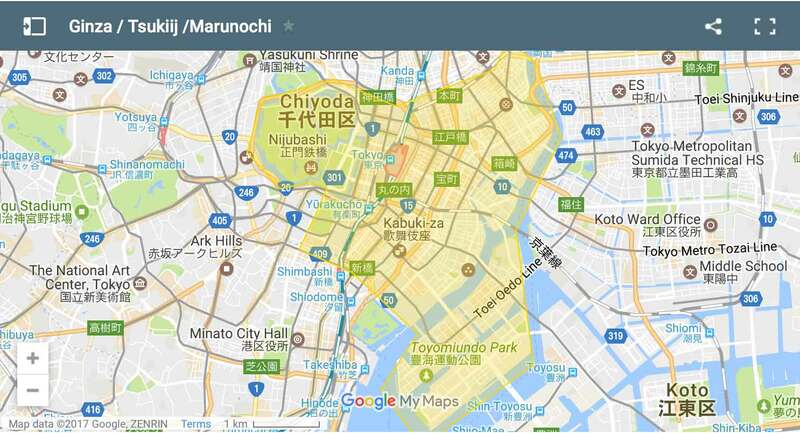 The heart of Marunouchi is, however, Tokyo Station, which is over a hundred years old. Imperial Palace (a short walk from Tokyo Station) – This Edo castle, formerly the Tokugawa Family’s residence, is now the residence of the Japan emperor. The Palace itself is closed to the public except on the 2nd of January and 23rd of December (the Emperors birthday). It is, however, possible to take a tour of the imperial grounds, but book ahead early through the Imperial Household Agency`s website. The Imperial Palace East Garden is open to the public without reservation. The Nijubashi Bridge in front of the main entrance is very famous and a favorite photo object. It is the geographic center of Tokyo, and where all distances were measured during the Edo period. Entrance is free. The old Tsukiji Fish Market – While the market itself has moved, the surrounding streets (Outer Market) are packed with rows of vendors selling all kinds of fish and seafood, and also many sushi restaurants. Shopping – Ginza is upscale shopping heaven with every high-end brand imaginable. Some favorites include the Ginza SIX (the biggest mall in Ginza), Ginza Mitsukoshi (high-end shopping with three floors of restaurants), or Ginza Wako (a beautiful stylish department store with a history back to WWII). Hama-rikyu Onshi-teien Garden – This gorgeous garden is a must-visit! Inside the garden is a beautiful tea house which dates back to 1704, nicely located by a cedar bridge. Have a cup of matcha green tea and some sweets and enjoy the views of the garden and the lake. Tokyo Station – This beautiful red-brick station building dating back to 1914 has gone through a restoration process back to its original form that finished in 2012. Ginza is upscale and modern and can lack a little in charm and history. Due to the upscale nature of the neighborhood, there aren´t a lot of budget accommodation available and Ginza is best suited to luxury travelers and shoppers with generous budgets. If you’re looking for a hotel near Tokyo station, then you can’t go wrong with the Tokyo Station Hotel. It’s one of those top-end hotels that just does everything right and leaves you wanting for nothing. The rooms are lovely, classily furnished with all modern comforts and a super comfortable bed. The service is top-notch, and the location is hard to beat with Tokyo station just a few steps away offering easy access to every part of the city. The recently renovated Palace Hotel has a fantastic location overlooking the imperial garden just a few minutes walk from the Tokyo Station. The rooms are among the largest you’ll find in any hotel in Tokyo and are elegantly furnished in a modern style with every conceivable comfort. There is an indoor swimming pool, a well equipped training center, and a spa. The staff speaks English very well, and the service is world-class. This is a luxury hotel with a quiet elegance about it and an excellent choice if you are looking for a calm oasis in the heart of the city. This is a relatively new mid-range hotel in an excellent location in the heart of Ginza. The Tsukiji fish market and Ginza’s upscale shopping and restaurants are all within easy walking distance and the Ginza station about two minutes away providing easy access to the rest of Tokyo as well as Haneda airport. The rooms are decently sized, by Tokyo standards, modern, minimalistic and well designed with flat screen tv and air con. Perfect for solo traveler or couples. Breakfast is excellent with Japanese and some western dishes on offer. The Wi-Fi is free and fast. This excellent budget hotel is right next to the entrance to the Tsukiji fish market with the Ginza shopping district just a short walk away. If you want to attend the early morning Tuna auction, this is a great option. The hotel is part of the Tokyu Stay chain of business hotels and offers brilliant value for money. The rooms are cozy and have everything you need. They even managed to include a washer and microwave in the rooms! Wi-Fi is free and strong. Roppongi is famous for entertainment and its nightlife, but it also contains several art museums, galleries, shopping centers, and theaters. Roppongi is probably the most international part of Tokyo where the wealthy foreign businessmen come to dine and party and where most restaurants will have a menu available in English. Roppongi Hills is the new heart of Roppongi and is an enormous complex including 220 restaurants and shops, offices, cinemas, a hotel, and art museums. From the top floor, the “Tokyo City View” you get fantastic views of Tokyo. You can also step out into the rooftop open-air “Sky Deck”. Mori Art Museum – Located on the 52nd and 53rd floors of Moro Tower in Roppongi Hills complex. The ticket to this museum also includes entry to Tokyo City View and Sky Deck. Nogi-jinja Shrine – Honours General Nogi, the hero of the Russo-Japanese War who committed suicide together with his wife when Emperor Meiji died. Nogis black wooden residence is on the same ground as this shrine. Zojo-ji Temple – This is most dramatic at dusk, as the Tokyo Tower lights the grounds from behind. Dating back to 1393, this is the most important temple of the Jodo sect of Buddhism (Pure Land). It contains a giant bell that is considered one of the great three bells of the Edo period. Tokyo Tower – Kind of like an Eiffel Tower rip-off, Tokyo Tower was finished in 1958 and is a symbol of Tokyo’s post-World War II period. It is 13 m higher than the Eiffel Tower in Paris. You can take the lift up to the main observation deck at 150 m, or up to the “special” deck at 250 m.
Atago-jinja Shrine – This shrine’s main feature is its giant stone stairway that leads up to the highest natural spot in central Tokyo. It is pretty at dusk when it is lit by lots of lanterns. Not much really, but if you choose the wrong hotel here, the nightlife can be loud. 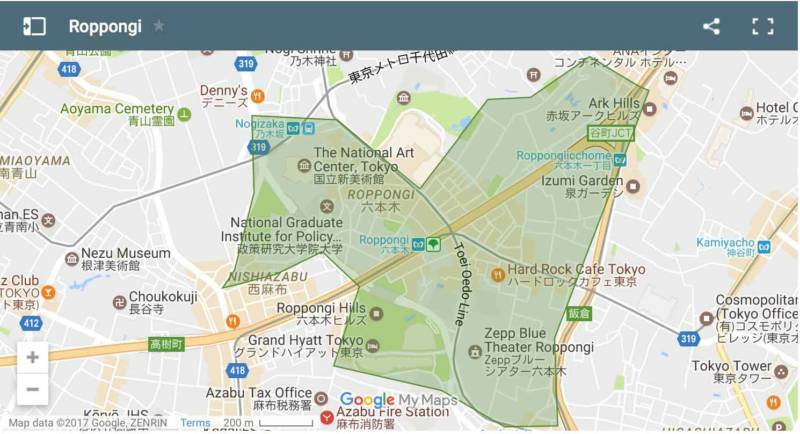 Roppongi is also not located on the JR Yamanote loop metro line, so there is no direct connection to for instance Shinjuku. It’s hardly a big deal though since it only requires one extra stop. One of the premier luxury hotels in Tokyo, the Ritz-Carlton is located in Tokyo’s highest building with spectacular views of the city, the Imperial Palace, and Mount Fuji. The service is excellent, and the rooms are large and elegantly furnished. There is an indoor pool, sauna, and a well-equipped gym. The metro station is just a few steps away, and the Midtown Galleria Mall, with plenty of shops and restaurants, is located at the base of the building. If you can afford it, it’s an exceptional place to stay. This is a stylish “hipster” boutique hotel located in the heart of Roppongi. The rooms are in modern Japanese style, clean, decent sized and well equipped with flat screen tv, air-con, and fridge. There is a cool little bar downstairs, and there are plenty of good restaurants in this area. You can walk to the Roppongi metro station in ten minutes. Hotel Monterey has clean and comfortable, albeit small rooms in an elegant old European style. The location is excellent in a quiet area as long as you don’t mind the slightly uphill five-minute walk from the Akasaka-Mitsuke Subway Station. The Wi-Fi is free and reasonably fast. The breakfast buffet is good with both Western and Japanese options. Ueno is a good choice economically as the hotels are cheaper here than in the more famous areas like Harajuku and Shibuya. This area is perfect for those interested in museums, art galleries, zoo, and parks. A big part of Ueno area is the lovely and huge Ueno-Koen Park, being one of Tokyo`s top draw ever since the Edo period. The park also houses some of Japan and Tokyo’s best museums, Tokyo National Museum being the biggest. To the north of the park, is Yanaka, a beautiful little area housing more than a hundred temples, relocated from all around Tokyo during the urban restructuring. Yanaka area miraculously survived both the big earthquake of 1923 that destroyed lots of Tokyo, the firebombing of world war II, and the modernization process of the postwar years. Walking around this area feels quite magical and is worth a visit. 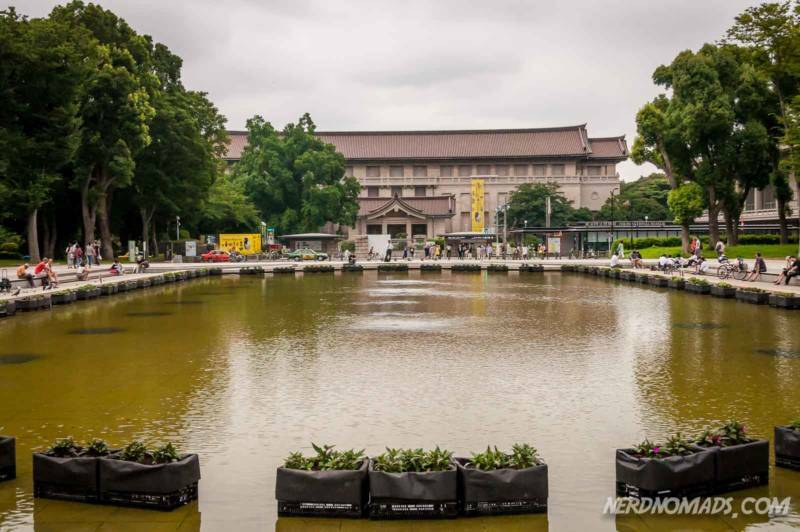 Tokyo National Museum – If you only want to visit one museum in Tokyo, then this is it! Here is the world`s largest collection of Japanese art, ancient pottery, religious sculptures, samurai swords, woodblock prints (ukiyo-e), kimonos, and so much more. The museum consists of several buildings, but Honkan (Main Gallery) is the most important. Ueno-koen Park – The park surrounding the museum is huge and even includes a lake, the Shinobazu Pond where you can paddle swan-shaped boats. It is Japan`s first public park, established in 1873, but is much older than that. Structures dates as far back as to the 17th century. There are several replicas of shrines and temples around Japan. The whole idea of the park was that Tokyoites could see the entire country in this park. It is like a pre-Disney-World. During weekends you can see acrobats, performers and food vendors in the park. Kanei-ji Temple – This temple was built in 1625 by the Tokugawa shogunate as a prayer temple. Six former shoguns are entombed here. Ueno Zoo – Japan`s oldest zoo, established in 1882. The biggest attractions are two giant pandas, Ri Ri, and Shin Shin. National Science Museum – Showcases the rich and varied wildlife of Japan, a rocket launcher, a giant squid, an Edo-era mummy, as well as a digital seismograph that charts earthquakes in real time. Tokyo Metropolitan Art Museum – Also houses temporary exhibits from leading international art museums like New York`s Metropolitan Museum of Art. National Museum of Western Art – The building of this museum is on Unesco`s World Heritage List, and was designed by Le Corbusier in the late 1950s. It houses art collection from medieval Madonna and Child images to 20th-century abstract expressionism. It has a whole gallery of Monet. Kyu Iwasaki-teien – This grand and beautiful building was once the villa of the founder of the Mitsubishi conglomerate. It was built in 1896 and restored and opened to the public in 2001. SCAI the Bathhouse – This was once a 200-year-old bathhouse, but is today a cutting-edge gallery space, showing Japanese and international artists. Not much, but it is a little bit out of the way from the “action” in Harajuku and Shibuya. Located just a five-minute walk from Ueno Train Station and with stunning views of Ueno Park, this hotel is deservedly one of the most popular in this area. The rooms are of average size for Tokyo aka small but well decorated with very comfortable beds, and all the modern amenities such as flat-screen tv and air con. The bathroom is a fascinating study in how to pack in a lot in a small space. The breakfast buffet is excellent with plenty of options for both Japanese and western dishes. The Onsen and spa department is lovely and well worth a visit. This has a nice location, just a 15-minute walk from Ueno Station and with a convenient store just outside of the hotel entrance. You can easily get to this hotel by a 40-minute Skyliner trip from Narita airport (Keisei Skyliner). They serve excellent breakfast buffet of both western and Japanese food and free soba (noodles) in the evening. The highlight of this hotel is, however, is the rooftop onsen with an open air view of the Tokyo sky tree. The onsen also has a cold pool and sauna. Asakusa is one of the few areas of Tokyo that still look much like it has for decades, having experienced little of the modernization that the rest of Tokyo has, except for the addition of Tokyo’s tallest building, the Tokyo Sky Tree. The area consists of low-lying residential buildings, so Tokyo Sky Tree sticks out and looks like it was dropped here by aliens. This area (Ryogoku) is also home to the National Sumo Stadium Kokugikan, so you will often see big chubby wresters waddling around, especially around Ryogoku Station. It is a quiet and laid-back area, especially compared to Shinjuku, Harajuku, and Shibuya. It is home to plenty of budget accommodations and is generally considered one of the least expensive areas of Tokyo to stay in. It is also an excellent area to shop for traditional Japanese crafts to bring back as souvenirs. If you want to head to Nikko for a day-trip, as we did, you can take the Tobu Nikko Line from Asakusa Station. Senso-ji Temple – This is Tokyo`s most visited temple. It has a golden image of Kannon (the Buddhist goddess of mercy), which was according to the legend pulled out of the nearby river by two fishermen in AD 628. In front of the temple, you will enter through a beautiful bright red gate Kaminari-mon. Once inside you will step down the shopping street of the temple, Nakamise-dori, where you can find souvenirs and genuine Edo-style crafts. At the end of this road is the temple itself, with the 55-meter high Five-story Pagoda. Free entrance! Tokyo Sky Tree – When it opened in May 2012, it was the world`s tallest free-standing communication tower with its 634 m. You can choose between two observation decks; at 350 m and 450 m. In good weather, you can even see Mt. Fuji from the tower! Tokyo Skytree also has an aquarium, Sumida Aquarium. Solamachi located at the base of Tokyo Skytree is a gigantic shopping mall with over 300 shops and lots of restaurants. Konica Minolta Planetarium “Tenku” is also located here where you can walk under the stars. Asakusa-jinja Shrine – This shrine, painted in a dark shade of red, dates back to 1649 and is an excellent example of an early-Edo architectural style. Built in honor of the two brothers who discovered the Kannon statue that led to the construction of Senso-ji Temple. Edo-Tokyo Museum – Exhibitions in this museum document Tokyo`s major transition from Edo to modern with lots of interesting facts. An excellent museum with impressive replicas and examples of Edo-era infrastructures. Sumida Park – This park is ideal for cherry blossoms. You can get a magnificent view of cherry trees in a line that goes for over one kilometer. In summer the Sumida River Fireworks Festival is held in this park. It’s a little out of the way location wise, but with Tokyo’s excellent metro system it is not much of a problem. The old neighborhood of Asakusa is home to most of Tokyo’s few remaining Ryokans, traditional Japanese Inns. Spending a night in one is a must-try experience when in Japan. 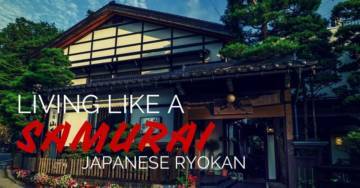 Why not try a Ryokan? 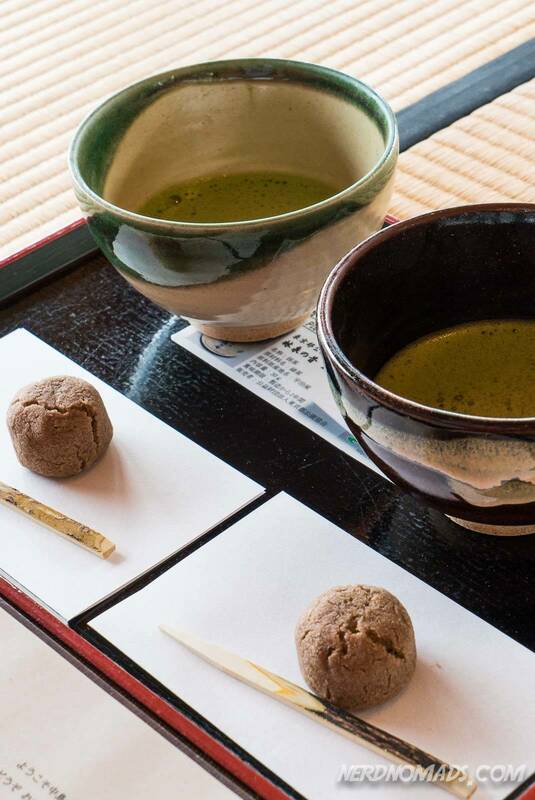 If you want to try a traditional Japanese Inn in Tokyo, then Sadachiyo is an excellent choice. 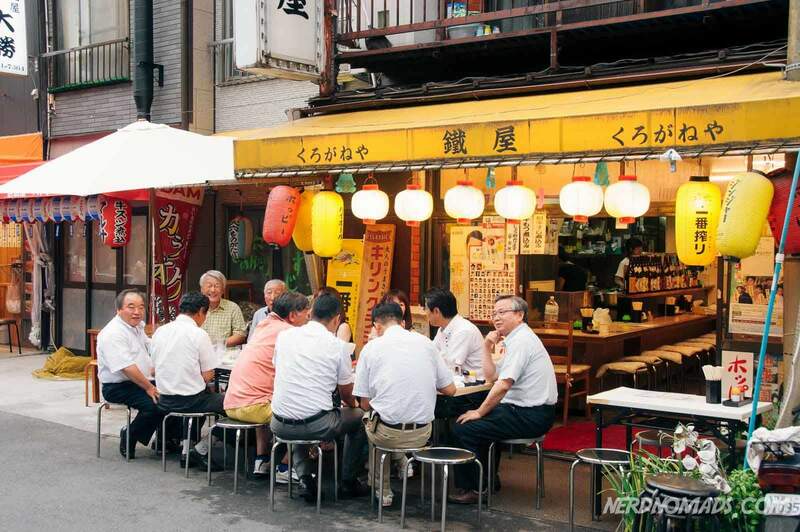 It’s located in a quiet part of Asakusa but still within walking distance of the top sights. Here you sleep on a futon bed, enjoy an Onsen (hot spring bath) and have a delicious authentic Japanese dinner and breakfast. Spending a night at a Ryokan gives you a real sense of the old traditional Japanese way of life and is an experience you won’t soon forget. The staff is very welcoming and helpful to foreigners, and the rooms all have private bathrooms. This is a relatively new hotel located a quick two-minute walk away from the Asakusa station, making it easy to explore the city. It’s also within easy walking distance to the Senso-ji Temple. There is a very nice open-air terrace and bar on the roof with a great view of the city and the Tokyo Skytree. The rooms are clean, modern, well equipped and reasonably spacious by Japanese standards. Breakfast is excellent, and the view from the restaurant on the 13th floor is spectacular. There is a supermarket downstairs. If you’re traveling solo on a budget or would simply like to try one of the famous and unique cube/pod hotels of Tokyo, then this is an excellent choice. It is a brand new hotel and quite spacious for a pod hotel. Every pod has lockable baggage storage and free Wi-Fi. The underground station is right next door, and there are plenty of places to eat in the neighborhood. Why Stay In Akihabara & Iidabashi? The Akihabara neighborhood is called Akiba and is the center of the geek culture, a Mekka for manga and anime fans from all over the world. It is great fun just to walk around the streets of Akiba and watch the craziness. 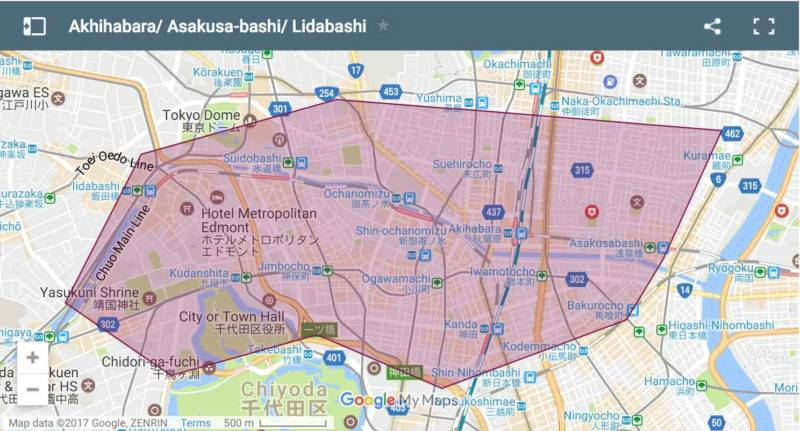 The Iidabashi/ Akihabara area was where the governing elite in the Edo-era lived and had their grand villas. Just north of the Imperial Palace (Kokyo Higashi-Gyoen) is the green lung Kitanomaru Park surrounded by a moat. Today the park house several museums. The park and the canal are lined with cherry trees which explode in pinkish colors during Cherry Blossom season (end of March till the middle of April), a very beautiful and popular area to take photos during spring. A visit to Akihabara today, however, is like entering a futuristic cyber-city packed with electronic! Its transformation into Electric Town started after World War II when this area around Akihabara Station became a black market for radio parts. Today Akihabara is THE place to head for bargains on new and used electronics of all kind. Maid Cafe – Have a coffee or soda at a very particular type of cafe, which originated in Akihabara. The waitresses dress as French maids and treat the customers as masters. It is innocent fun, and a bit embarrassing! Shop for manga comics and action figures – five floors shopping malls packed with only manga comics and action figures. 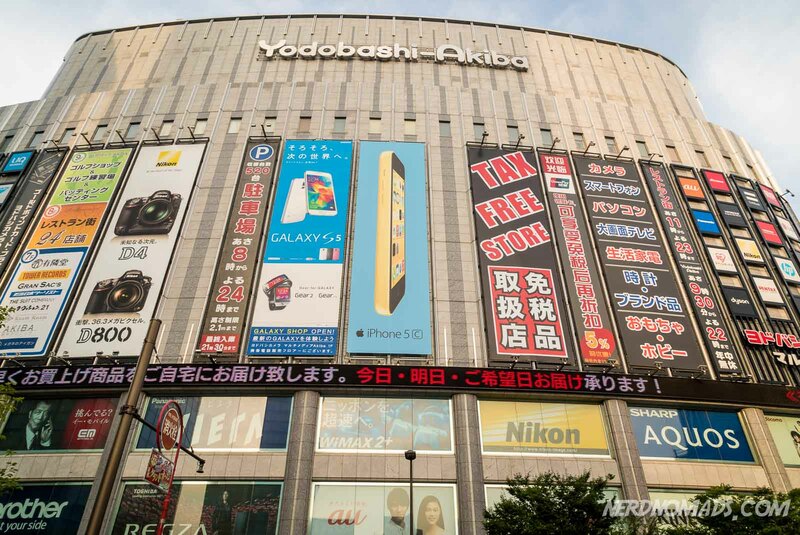 Electronics and camera shopping – Take a wander through the eight floors Yodabashi electronics store, one of the largest camera stores, in the world or visit the Akihabara Radio Center. A two-story building packed with everything from connectors, jacks, LEDs, switches, semiconductors and all other electronic components you need or did not know you needed! Jimbocho – This neighborhood is heaven for us book-lovers. Here you will find approximately 160 secondhand bookstores. Although most books are in Japanese, you can find art tomes, vintage manga, and anime, as well as other collectibles. Yasukuni-jinja Shrine – This beautiful shrine completed in 1869 in memory of to Japan`s war dead (2,5 million souls). The shrine has torii gates made out of steel and bronze, which is unusual as torii gates are usually made of wood. Museums – Yushu-kan (war museum starting from the samurai tradition), National Showa Memorial Museum (World War II), National Museum of Modern Art (Meiji-jingu ShrineAT), Crafts Gallery (ceramics, lacquer work, wood carving, textiles, etc.). These museums are all located in the Kitanomaru Park. Koishikawa Korakuen Garden – This beautiful garden from the 17th century and was the property of Tokugawa clan. Here you will see landscape architect elements of both Chinese and Japanese. The garden has a lovely bridge, the Full-Moon Bridge, which dates back to the early Edo period. Tokyo Dome Stadium, home to Japan` top baseball team the Yomiuri Giants is located next to the park Koishikawa Korakuen Garden and is an attraction in itself with both a spa (with an upscale Onsen), an amusement park, and Japanese Baseball Hall of Fame & Museum. By the way, did you know that baseball was imported to Japan by an American teacher in 1872 as a hobby, and is now a national obsession? Kanda Myojin Shrine – Built in 730. It is said to bring luck in business, family, and finding your future man or woman. Nicholai-do – A beautiful white Orthodox cathedral built by St. Nicholai in 1891. This is not where things are happening when it comes to nightlife, disco and partying. It is a rather quiet area in the evening and night, especially in Asakusabashi. This hotel provides a lot of value for the money. It’s in a convenient location with Okachimachi and Akihabara JR Yamanote line stations close by so getting around the city is very easy. 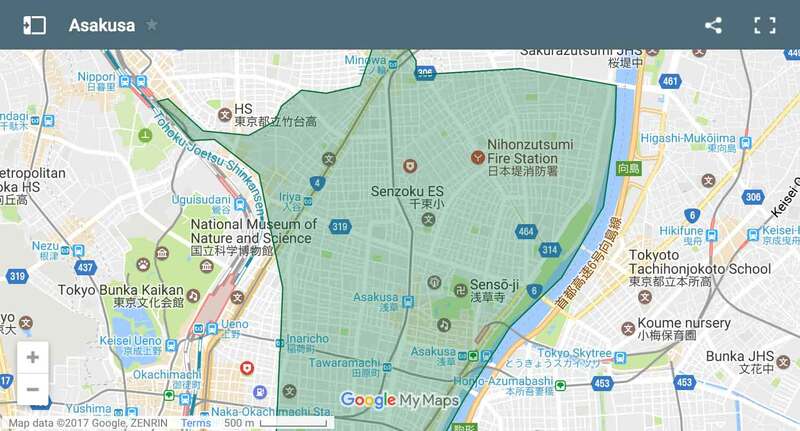 You can also walk to Ueno Park and the museums in about 15 minutes. Rooms are small but clean and with private bathrooms and flat-screen TV, refrigerator, and air-con. There is an Onsen (hot spring bath) for free usage as well as a laundry room. The free Wi-fi signal is fast and the complimentary Asian buffet style breakfast is surprisingly okay. Across the street, there is a Seven Eleven with an ATM that accepts foreign cards. The first time we landed in Tokyo we had pre-payed a hotel that turned out to be terrible. We stayed the one night and then we found this hotel. It was everything the other one wasn’t. Clean, modern, comfortable and affordable. The rooms are small (book a twin room for more space) but surprisingly well supplied with flat screen tv, refrigerator, air con, and free Wi-Fi. There is washer/dryer on every floor. There is a convenience store downstairs, and there are lots of small cozy restaurants in this quiet residential neighborhood. The Asakusabashi station is just a couple of minutes walk away, or you can walk to the much larger and better connected Akihabara station in 10 minutes. Why Stay In Odaiba & Tokyo Bay? The Odaiba and Tokyo Bay area is a bit different from the rest of Tokyo, and a result of urban planning. This area was developed and rebuilt in the 1990s and has a modern vibe with its wide streets and big buildings. Consider staying here if you’re looking for more of a resort feel away from the busy center of town. It is also an excellent choice if you want to visit Tokyo Disney Resort. The waterfront, the promenades, and walkways are this area`s main attraction with a lovely view of the Rainbow Bridge, especially after dark. Tokyo Beach – The only beach in Tokyo where you can lay down on the white sand and get a tan. Swimming is not allowed but you can dip your toes in the water. 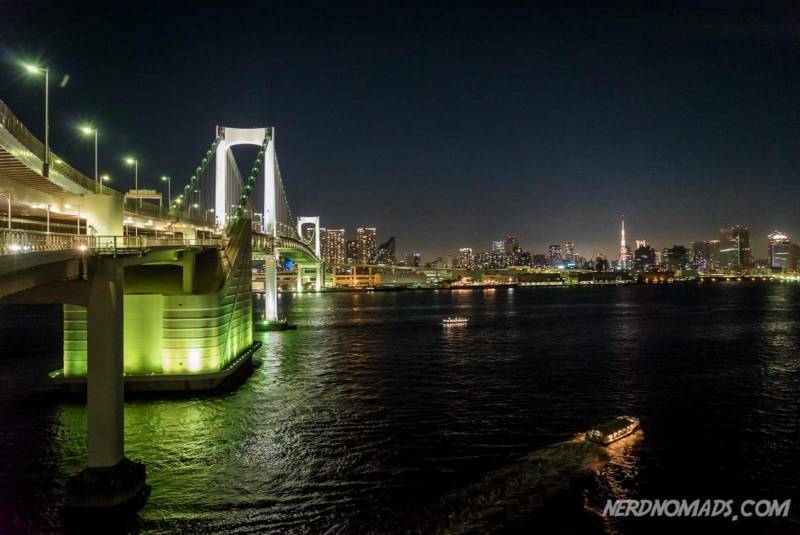 Rainbow Bridge – Rainbow Bridge (918 m long) connecting Odaiba and Shibaura is beautifully lit in green and yellow colors after dark. We walked over the bridge to Odaiba, and really enjoyed it. On the way back we took the driverless Yurikamome monorail, which departs/ends at Shimbashi station and goes in between skyscrapers and crosses the bridge. Fuji TV Building – The big building hosting the Fuji TV headquarters was designed by the world famous architect Kenzo Tange. The building contains facilities like a cool globe-shaped observatory, theater mall, Kikkake street, and several restaurants. All of these are open to the public. Open from 10 – 18 every day except Mondays. Palette Town – This is a gigantic shopping kind of mall, consisting of many shops, Toyotas car showroom “Mega Web”, the giant Ferris wheel that symbolizes Odaiba, the concert hall “Zepp Tokyo” and an indoor amusement center “Tokyo Leisure Land”. DiverCity Tokyo Plaza – a shopping and entertainment mall with plenty of shops and restaurants. In front of the plaza is a gigantic 18 m tall 1:1 scale model of Gundam, the robotic mobile suit from the popular anime series Gundam. The shopping is open 10 – 21, while the restaurants are open from 11 – 23. 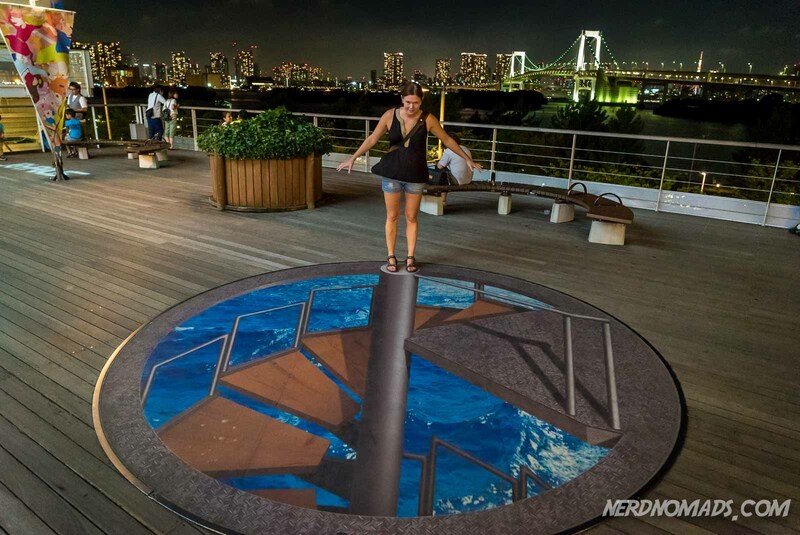 Decks Tokyo Beach – This shopping mall has an open deck resembling a ship deck. From here you have an awesome view over the Rainbow Bridge. We had dinner here at an Indian restaurant, delicious food! At the Decks, you can also visit Madame Tussauds Tokyo, Legoland Discovery Center Tokyo and Tokyo Joypolis, a three-story indoor amusement park operated by the game-maker Sega. Oedo Onsen Monogatari – This hot spring theme park pipes in hot spring water from 1400 m below Tokyo Bay. It`s interior is like an Edo-era town made in Disneyland-style with games and food stalls. You can enjoy 13 bathhouses including two indoor natural hot springs. Tokyo Disney Resort – This amusement park is Japans most visited site! The park is two parks; Tokyo Disney which is modeled after the original in California, and Tokyo Disney Sea which has shows and international pavilions. To pay for a Fast Pass can be a good idea, to cut down on the queueing time. National Museum of Emerging Science & Innovation (Mirai-kan) – With the name Miraikan, meaning “hall of the future”, you will experience futuristic science and technology that will likely shape the years to come. This museum is full of hands-on displays, which is great fun and very interactive both for kids and adults. The demonstration of the human-robot Asimo is great! The museum also has a theater/ planetarium, Gaia dome, which has an English audio option. It is a good idea to reserve your seats at this planetarium as you arrive at the museum as it usually gets full. Opening hours: 10-17 every day except Tuesdays. Expect to use at least 20 minutes to get into the more central areas like Shinjuku and Shibuya. Located in the Tokyo Bay, the Grand Nikko Tokyo Daiba is more of a resort hotel than a city hotel. With both indoor and outdoor swimming pools, Jacuzzi, sauna and a location just five minutes walk from Tokyo Bay beach it’s a great choice if you want to get away from the crowded inner city. Still with a location right next to Daiba station you can get to Tokyo city center in about 20 minutes. There are plenty of restaurants and shops nearby at Aqua City. The hotel’s rooms are large by Japanese standard and come with every modern comfort such as flat screen tv, air con, safe, and free Wi-Fi. Breakfast is served on the 30th floor with impressive views over the bay and is buffet style with both international and Japanese dishes. This is one of the most popular hotels in Shiodome and for a good reason. It has an excellent location close to two stations (Shiodome and Shimbashi) which is very convenient for getting around Tokyo. It is actually located above the Shiodome station, very close to many restaurants. The airport bus stops right at the front door of this hotel. The rooms are larger than normal in Tokyo. From the hotel, you have a great view of Tokyo Tower. Everyone highlights the service at this hotel, which is awesome. A recently refurbished, modern and classy hotel offering stunning views of Tokyo from its location 24-38 floors up the Shiodome Tower. The hotel is close to both the Shimbashi and the Shiodome station making it very easy to get around. There are restaurants, shops and a convenience store downstairs. Ginza and the Tsukiji fish market is a quick 15 minutes walk away. The rooms are, as most budget hotels in Tokyo, minuscule but comfortable, clean and have a flat screen tv, fridge, safe and air con. Puh! There you have it, our eight favorite areas of Tokyo. 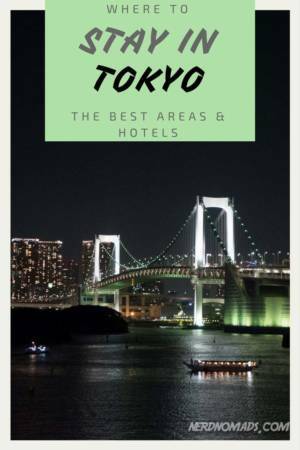 I hope this helps you when deciding where to stay in Tokyo and what Tokyo hotels to book. Have an awesome time in Tokyo! If you are looking for an overview of what to see and do in Tokyo, check out our recommended Tokyo itinerary packed with cool and must-see things. We will continue to add more hotels and tips about these areas of Tokyo, so please comment below if you have any suggestions or recommendations that we should check out next time. 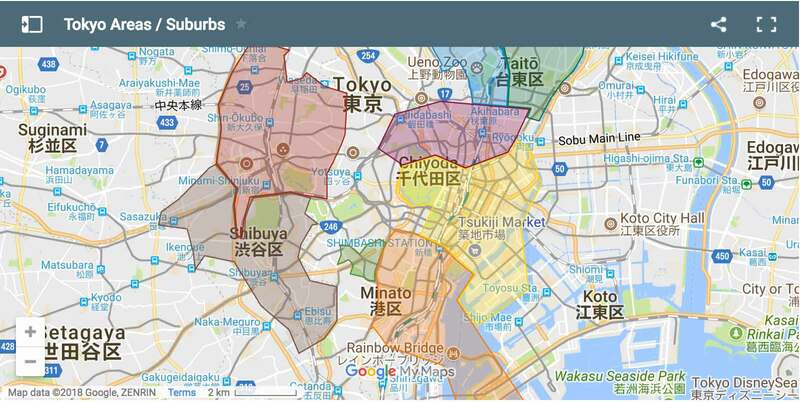 Awesome introduction to Tokyo’s different areas. 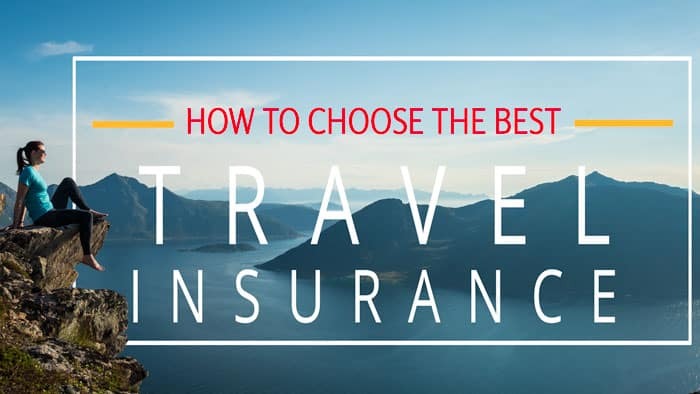 It really helped me to decide where I’m going to stay on my upcoming trip to Japan. Keep up that amazing work! Thank you so much, Niko! 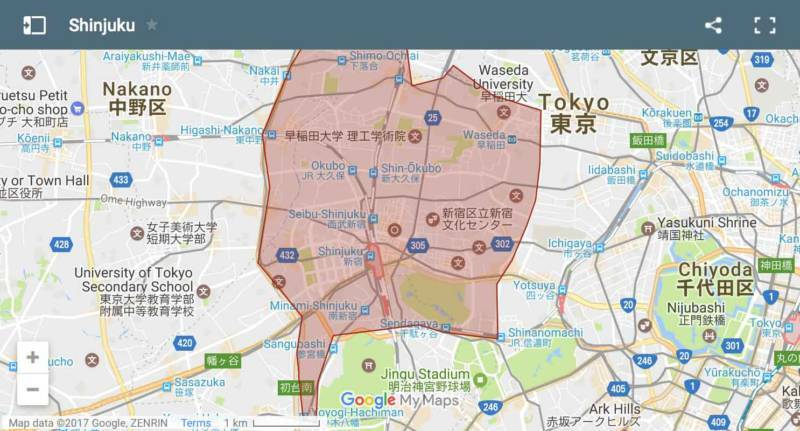 Glad this could be of help to you when planning where to stay in Tokyo. Have a great trip, and enjoy Tokyo! Wow, really comprehensive post. It is always hard to decide where to stay in Tokyo as it is such a big city. And as always, where you stay can have such a big impact on the experience. I have previously stayed at the Best Western Shinjuku on a few occasions and would recommend it. Thanks for the recommendation about Best Western Shinjuku! 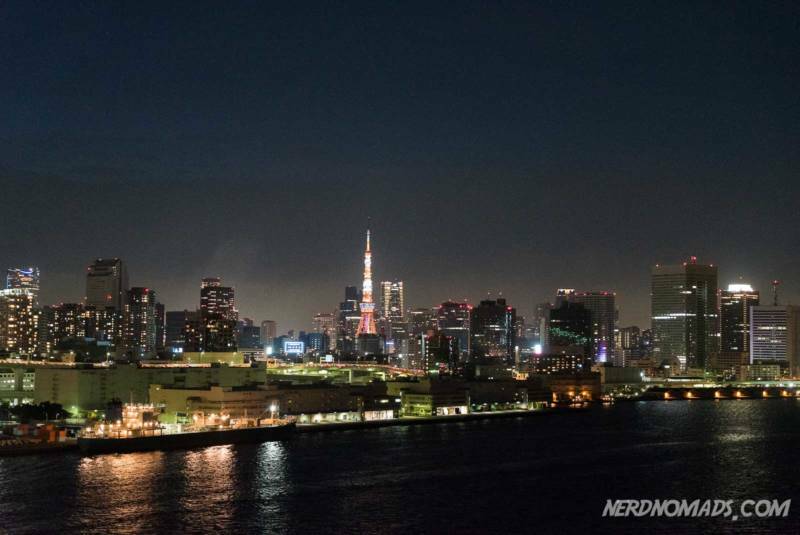 Tokyo is simply stunning! Your post is very helpful and motivational, Maria! Oh boy, monster post! But well covered. We split up our stay in Tokyo between Asakusa and Shinjuku. Both very different – but we really liked Asakusa: lots sights but also more laid back. And the river a great place to go for a jog. Plus we also went to Nikko so as you say it’s perfect for that. Was our favorite area in the city. I agree I like Asakusa better than Shinjuku too when it comes to accommodation as it is quieter. Love the river! We stayed the longest in Asaskusabashi, which is a great and laid back neighborhood. Hi! I have just started looking on where to stay and now totally confused. Previous stayed in Shinjuku for two days but looking to go to Tokyo to have a good look around for 10days. Was disappointed where we stayed last time as just in the wrong area. We want shopping centres and the crazy coffee shops and some history. Where do recommend? Or try a couple of different areas over the time? It all depends on what is the most important to you. You probably won’t find an area that has everything but with Tokyo’s excellent metro system you can get around very easily. Apart from Shinjuku, Shibuya is another major shopping district with large shopping centers. If you are looking for more upscale shopping then Ginza and Marunouchi, west of Tokyo Station are both great areas to stay in. 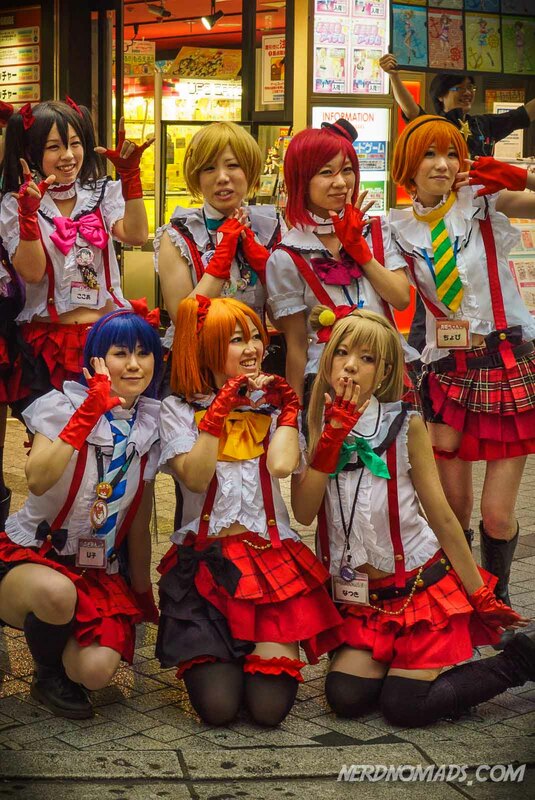 You’ll find the highest geekiness factor and the crazies cafes staying around Akihabara. While the old historic district of Asakusa is a more quiet part of town with older architecture and some beautiful temples. Of course, there are a lot of exceptions here, for instance, the famous Robot Restaurant is in Shinjuku. If you will be spending most of your time shopping then generally the areas to the west of Tokyo is where I’d recommend. Shinjuku, Shibuya, Ginza or Marunouchi. This is very comprehensive! I will revisit closer to my travel date. Thank you so much, Wil! 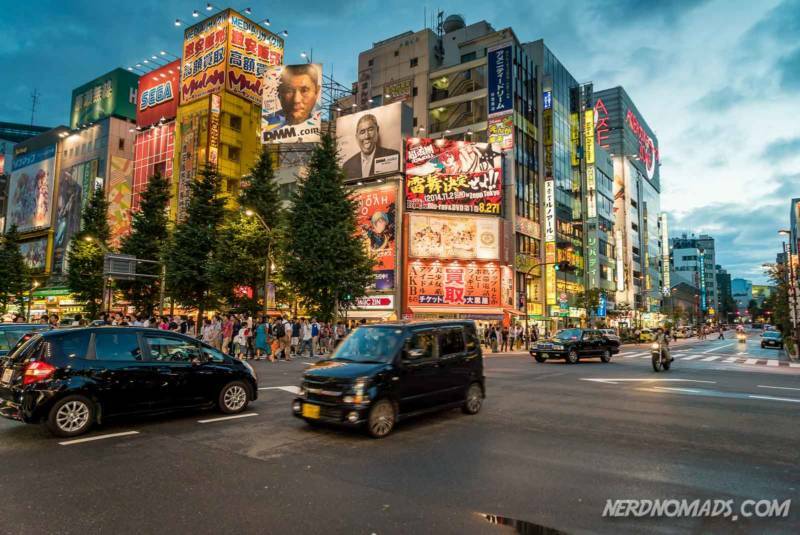 Tokyo is a great city with so much to see and do. Have a great trip! Amazing overview of Tokyo. I am going to travel to Tokyo in mid March, and I am looking for a place to stay close to the Tsukiji fish market, since I want to visit early in the morning. The hotel you recommended, Tokyu Stay Tsukiji, looks like a great choice and I will check it out. Thanks for sharing! Thanks a million!!! 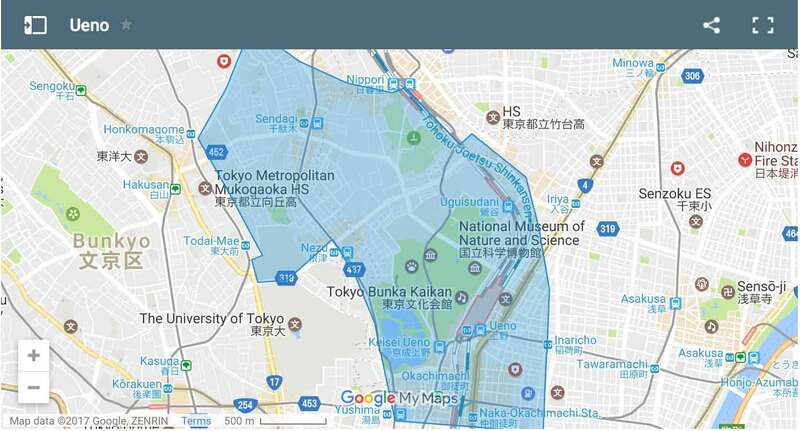 So happy to hear that our article could be of help to your when finding your accommodation in Tokyo! The Tsukiji fish market is great, and as you say, you should head there early in the morning. Where to stay in Tokyo was really helpful for me to book a hotel room. I am going to be there for one complete day and plan to take a day tour. In the train can suitcases be taken easily? I will be landing in Haneda airport and the second day I leave from Narita. Which area hotel would suit me since I want to see maximum. Thank you so much! Glad our article could be of help to you when booking your Tokyo hotel! Yes, you can have suitcases on the train although really big suitcases can be a bit tricky to get up and fit on the shelf. But a small/normal suitcase should be fine. Shinjuku area is the most popular area to stay in as it is very easy to get around Tokyo from that area. Have a great trip to Tokyo and enjoy your day there! This is truly “the ultimate guide” – so much detail! Thank you so much for putting this together. And a really great blog – so happy I discovered this. Thank you sooooo much!! You are awesome! 🙂 Your comment really made my day. Happy travels! Hi Maria , I chanced upon your blog when looking to book hotel in chiang mei. Now we’re planning a trip to Japan, your post has really helped understand as to where to stay. Keep up the good work. It really helps ? Thank so much! 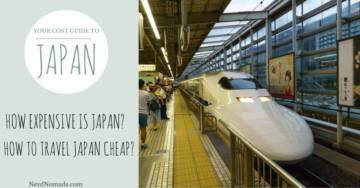 So cool to hear that our posts about Japan could be of help to you when planning your Japan trip! Have a great trip to Japan!! Great Blog Maria!!! 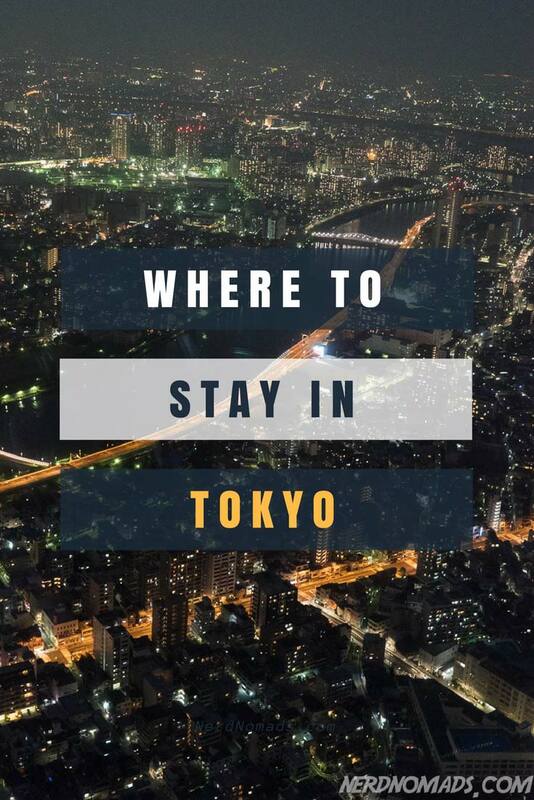 I am planning a trip to Tokyo in May and this guide will definitely help me decide. Which websites your recommend to search for once a area is finalized, which will give reliable and budget listings? Thank you so much! We really like Booking.com. 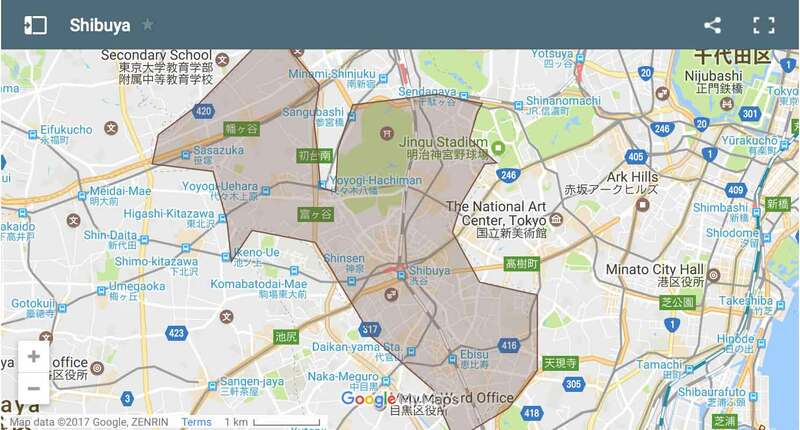 There you can search for a certain area in Tokyo, and they also have free cancellations. Agoda.com is also good for Asia. Have a great trip to Tokyo in May! What a great and detailed blog that covers everything. I’m planning a trip to Tokyo for 6 (2 kids aged 10 and 12 + parents aged 70). I’ve tentatively booked Tobu Hotel Levant Tokyo. I’m hoping to visit the following places. Can you please tell me if the hotel is convenient to travel around to the places that I’m hoping to visit? I would appreciate if you have other recommendations in terms of places to stay/visit. Thank you so much! So cool that you are going on a big-family-trip to Tokyo! You will love Tokyo and Japan, it is such a great city. The Tobu Hotel Levant Tokyo has a nice location right by the Kinshicho Station (only a 3-min walk), from where you can take the Hanzomon Line (purple) to the places and sights you want to see. Very convenient. It is outside the areas that we recommend, but not that far out. Disney Sea is a bit out of downtown Tokyo anyway, and from Kinshicho Station it will take you 45-60 min to get there by MRT and bus. As for places to visit in Tokyo, you can find our recommended Tokyo Itinerary HERE (just pick what suits you and your interests). You can find our recommended Japan Itinerary HERE, with a recommendation on places to stay at each place including the Mount Fuji area. Have a great trip to Tokyo with your family! Great blog! I booked flights and sumo tickets but kept putting off booking the hotel because it felt really overwhelming. This guide was so helpful! It’s my first time to your site and I’m so glad I found it. Can’t wait to see what you post next. Thank you so much!! You made my day with your comment! 🙂 So happy to hear that our articles can be of help to you when planning your Tokyo trip. Have a great trip to Tokyo, and enjoy the sumo! This is great Maria! Thank you so much for the info. I just would like to ask if you have something like this for Nagoya? If you happen to have tips in getting a cheap plane from Manila to anywhere in Japan for the period Dec 29 to Jan 3, please do help me. Again, thank you! Great! Although there is a direct connection between Roppongi and Shinjuku on the Oedo line and to Ginza on the Hibiya line (it’s more connected than some Yamanote line stations like, say, Ebisu). Sometimes Roppongi can be even seedier than Shibuya or Shinjuku at night haha. Thank you for the tip about the direct connection between Roppongi and Shinjuku, and to Ginza. Really appreciate it! I’m so glad I found your blog about accommodation in Tokyo. Just booked flights to Japan and flying into Narita airport. Looking forward to researching areas to stay with the help of your guide. 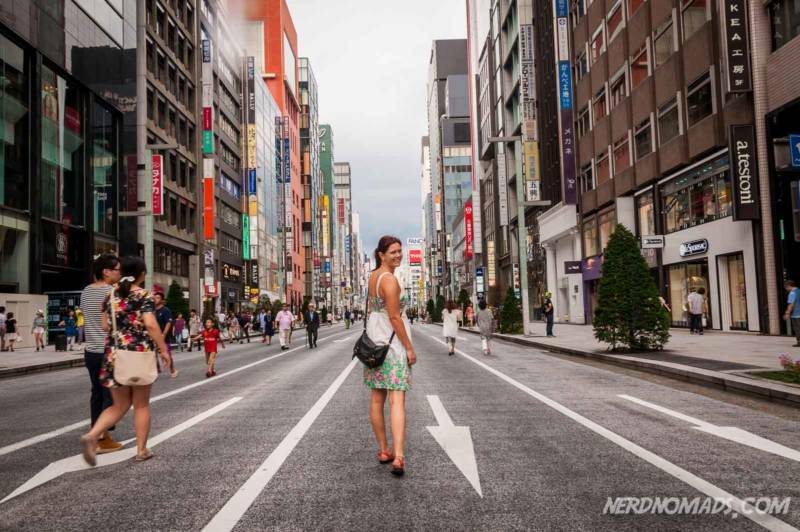 I had no idea how big Tokyo is, it is very overwhelming already but your guide will help! Thanks! Have a fantastic trip to Japan! And good luck with finding the perfect accommodation in Tokyo that suits you and your budget. 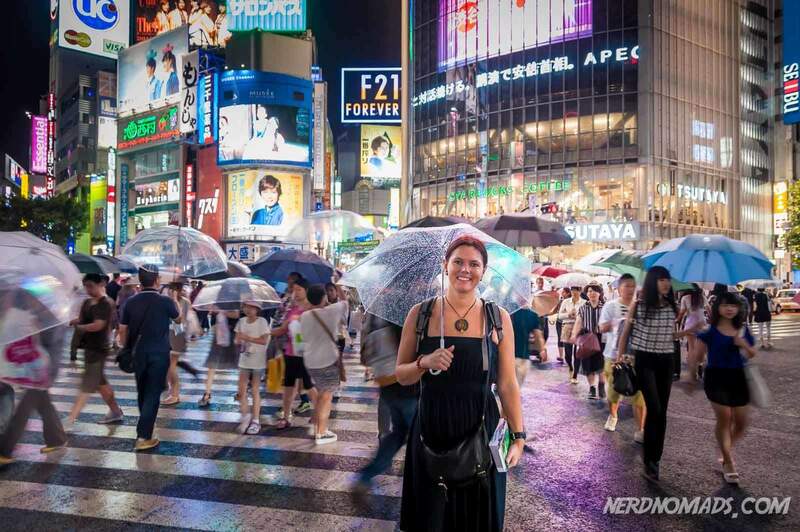 It’s amazing how much there is to see and do in Tokyo! All the lights, the food and there are just endless activities. I found it was always buzzing with life and it’s a very none stop atmosphere but also so much fun to discover! 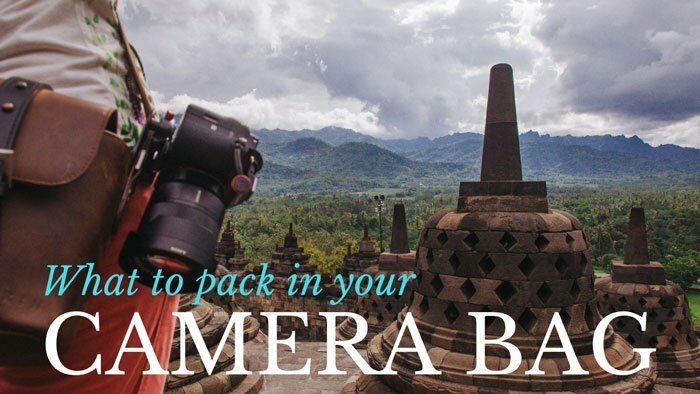 With all the things to do this post is great, it’s super informative I’ll definitely come back to it when considering where to stay next time I visit! Thank you so much! Yeah, I agree, Tokyo is awesome with so many things to do! 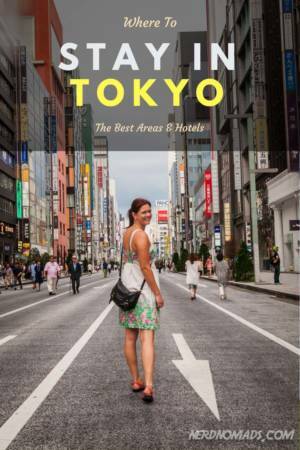 It has a lot of great hotels at different budgets, but it can be a bit overwhelming finding out which area of Tokyo to stay in. This is an amazing post! 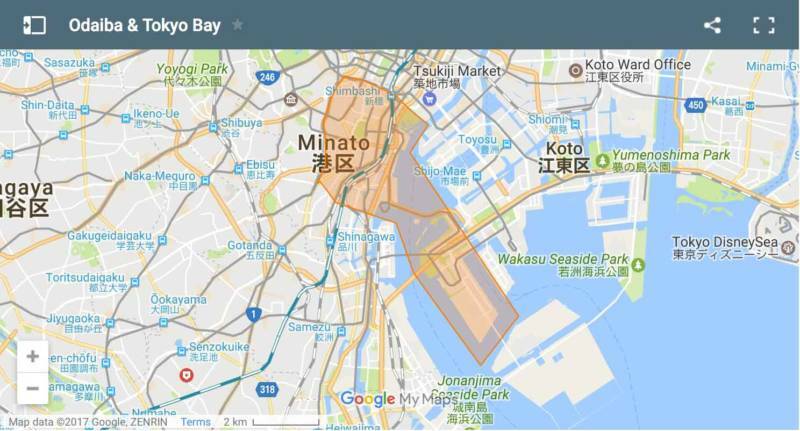 So incredibly insightful and helpful for those of us who are new to Tokyo travel planning – THANK YOU! Question…we are three adults visiting Tokyo for first time but only there for three nights before heading to Korea. We’ll be jet-lagged but want to see as much as we can. Do you think Shinjuku is best and should we look to hire a guide to be efficient with our time? Thank you sooooo much for your nice words about our blog! 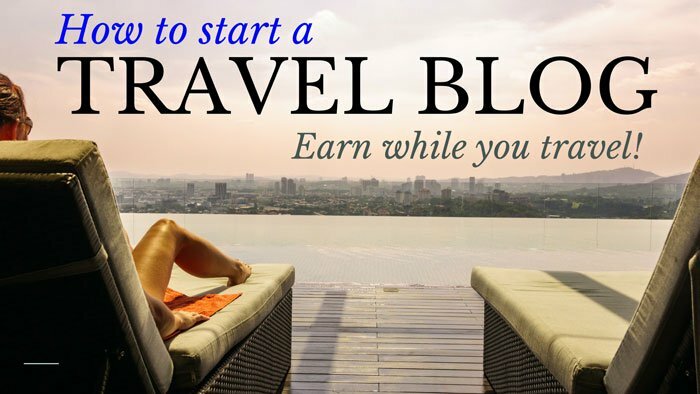 So happy to hear that our blog could be of help to you when planning your Tokyo trip! 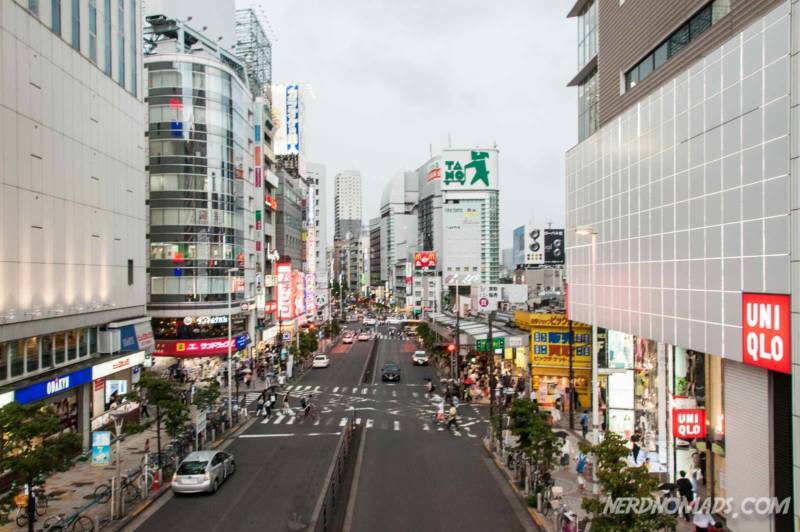 Shinjuku is a great area to stay in when visiting Tokyo for the first time! It is the most popular area to stay in, and for a good reason. It has a central location and is modern with lots of restaurants and shops so it is easy to find something to eat and places to stay. It is also easy to get around Tokyo when staying in Shinjuku as there are several metro and train lines that run through Shinjuku: JR Yamanote Line (also called the loop line between the biggest train stations in Tokyo), Shinjuku Line, Marunouchi Line, and Odeo Line. Shinjuku has an awesome nightlife as well, so you will not have a dull moment if staying in Shinjuku. 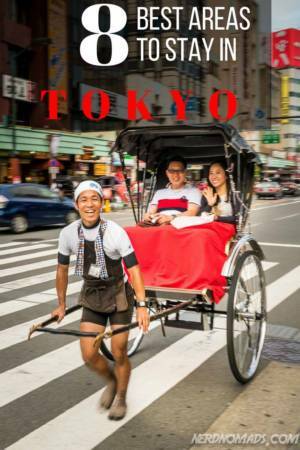 Yes, it might be a good idea to hire a guide to maximize your time in Tokyo, at least one day. You can find our recommended Tokyo Itinerary here (although it is for five days, so you will have to cut something out). Have a fantastic three-day-trip to Tokyo!